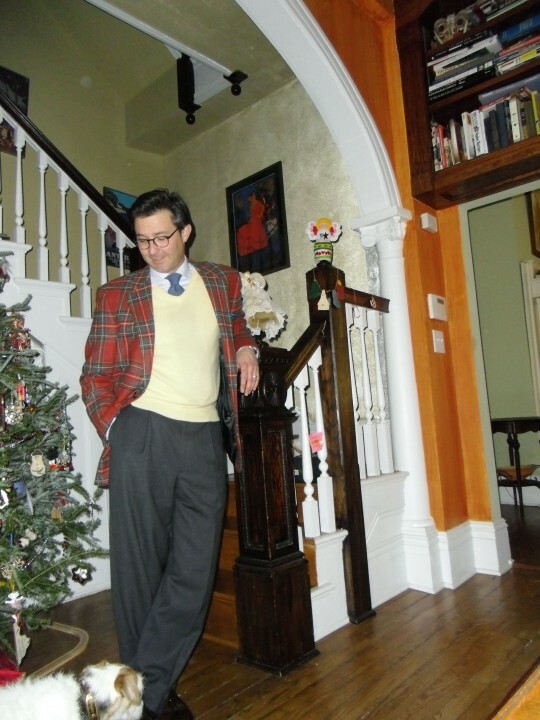 I used to only wear this sport coat to holiday parties. It becomes quite memorable as you can guess. But with the cold, damp and dreary days we’ve had, I felt like wearing a little colour. The trick to downplaying the holiday-ish-ness of the thing is to pair it with (relatively) sedate accessories and play up something other than the red. Here the cashmere yellow sweater pulls more yellow out of the pattern. The shirt is a black and blue Tattersall. The tie is light and navy blue houndstooth done in cashmere. Medium grey flannel trousers with single pleat and side tabs (from my ICON collection) and my new Alden whisky cordovan tassel loafers round things out. I used a pocket square that is electric blue with a green pindot by Charvet. You might say that I’m pushing the envelope, but I feel like I’m wrapped in a warm horse blanket when I wear my plaid sport coat. Barrymore, who knows these things, sees nothing amiss. Horse blanket coat. Shell cordovan shoes. They bring things full circle. This entry was posted in Elegantology and tagged Alden, Charvet, country clothing, ICON collection, men's casual clothing, Tassel Loafers, wearing plaid. Bookmark the permalink. I have Christmas pants exactly like that. I have a tartan skirt and somehow I did not don it over the holidays….but you are making me re-think the wearing o the plaid! I acquired a plaid sport coat last year and didn’t pick it up from the tailor’s until after the holidays so I never wore it. This year I wore it the first chance I got and loved the response I got. I was wondering if it was appropriate to bring it out again post holiday and you’ve answered my question! I likes it! I have a lightweight half-lined horse-blanket odd jacket from Isaia. It’s a pale orange (melon?) with a green and ivory over-plaid–maybe something else I can’t remember. I bought it in Lost Wages and brought it home to be tailored. Before I took it to my man Ayhahn my girlfriend told me she hated it. I told her that I would get nothing but compliments when I sport it… After 4 summers I can say, without equivocation, that I’ve never in my life received more compliments from strangers than I have on that coat. 47 and counting–four from just one visit to Ralph Lauren and RL in Chicago on the same day. My motto: Go big or go home. Slightly modified: Go ugly early. I like your coat, my good man. The plaid sport coat is the perfect foil to the typical winter outfit. Of course we’re prone to dandify everything, but even the average gent could don such a thing with ease and up his level of elegance. Of course, I’m of the relatively odd mindset that even some of the most wildly colored or patterned garments, when impeccably tailored, can look amazing.